E-book readers such as Amazon’s Kindle have tried to do for books and newspapers what the iPod has done for music and videos—offer a device that can hold and access tons of content on the go. 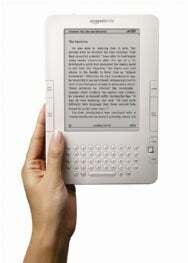 The standard Kindle, for example, weighs only 10.2 ounces, but can hold more than 1,500 books (from a store of more than 300,000) on its 2GB of internal storage. A paperback copy of James Joyce’s Finnegans Wake , by comparison, is 1.1 pounds and—although it may take a lifetime to get through—is just one book. Advancement through technology, to be sure. But what about making that technology accessible to more people, such as those with disabilities? My wife’s step-mother has Amyotrophic lateral sclerosis (ALS)—commonly known as Lou Gehrig’s Disease—a progressive neurodegenerative disease. She also loves to read, but can’t hold a book or turn its pages. She bought a Kindle last year (it was officially sold out at the time, but a friend sent an e-mail to Amazon explaining her situation, and the company was kind enough to sell her one), hoping it would let her continue to enjoy reading books. At the time, she could still press the button to turn pages on the Kindle—unfortunately that is no longer the case. There are expensive add-ons for a wheelchair that might let a person navigate a device such as this, but what about a way to control the Kindle with your voice? Sure, you can purchase audiobooks or listen to some Kindle books using its text-to-speech capability (although she prefers to actually read books) but those options still require user interaction for control. E-book readers don't generally have microphones, so software tweaks wouldn’t solve the problem. But an optional mic that connects to the hardware, or an integrated mic in future models, could. In order for e-book readers to realize their full potential, shouldn’t they be accessible to all?